JG Ballard’s world of dystopian urban landscapes set somewhere in the near future has become so recognisable that he’s gained his owned adjective: Ballardian. These Ballardian novels evoke collapsing societies set against shiny modern worlds that are at once a sci-fi step removed from us and yet all too recognisable. In Ballard’s world, the collapse of our so-called civilised society can be sparked by something as simple as a smashed champagne bottle. Ballard understood the fragility of the human psyche better than most. His teenage internment in a Japanese prisoner of war camp in Shanghai, described in his autobiography Empire of the Sun, shaped his view of human nature and, in turn, his novels. 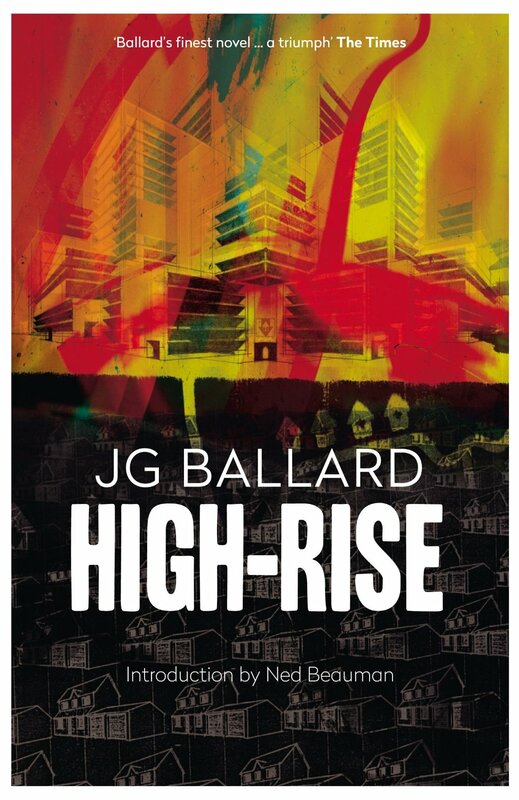 High-Rise is the second in Ballard’s urban disaster trilogy, book-ended by Crash and Concrete Island and follows the professional middle-class inhabitants of a flashy newly built, upscale tower block as they revolt against it. I first read High-Rise years ago during my “Ballard-period” (I used to have a habit of reading an author’s oeuvre consecutively, an excellent way of killing your love for a writer) back in my pre-London days. Its tale of professional people descending into anarchy within a 40 storey tower block has loomed large in my mind ever since, especially now I live in London and am under the shadows of tenement blocks that are increasingly owned by high-earning white collar workers. (The Erno Goldfinger designed Trellick Tower in Ladbroke Grove, which is said to be one of the inspirations of High-Rise and was originally built solely for council tenants, is now one of London’s most sort-after addresses. Art, life etc). Ballard begins the novel at the end with one of literature’s most enduring sentences before rewinding to the moment Dr Robert Laing pinpoints as the trigger that set off the building’s decline into a violent, lawless society with its primitive class system and clan-led brutality (that champagne bottle). Amongst those sharing Laing’s experiences of a civilisation gone to ruin high above the streets of London are Anthony Royal, the building’s architect, a modernist Bond villain-like character presiding over his kingdom like a deposed despot – or your average London landlord. Then there’s Richard Wilder, a burly TV director on whom perhaps the building has the biggest impact, his madness gaining currency as he climbs the floors in a bid to conquer his concrete mountain. As the swimming pools fill with the carcasses of dogs and the air-con vents are blocked by faeces, the three men attempt to seize control of their minds – and the building. Ballard’s vision of the impact architecture has on the individual runs through many of his novel and it’s particularly obvious in High-Rise where the building is as much a character as the tenants. But while the middle-class inhabitants of the tower block desend into anarchy, Ballard’s not dismissing this return to a simpler life as a bad thing. Are, he seems to be asking, Laing and his neighbours simply de-evolutionising back to where we should be? See how easy our primeval power makes it for us to adapt to less sophisticated situations (this is the same logic I apply to music festivals). And while High-Rise is often described as a vision of urban dystopia, when we first meet Robert Laing, he’s having a jolly old time gnawing on a dog’s barbecued leg amongst his rubbish strewn balcony, describing himself as the happiest he’s ever been. So perhaps it’s the world outside the high rise that is getting it wrong? I enjoyed lapping up Ballard’s hugely imaginative and sinister world again, although I remembered half way through High-Rise that bingeing on Ballard had given me a distaste for his very distinct writing style. He writes with economy and little emotion, his prose as brutal and cold as a tenement block in November. Similarly, his characters are broadly sketched and his prose remains at a constant, middle-lane pace. Of course the simplicity of his writing hides his brilliance as a writer, the shocks of violence all the more brutal told with minimal fuss, while the juxtaposition of events are more sharply felt by the blandness of his description. As a vision of an urine-soaked hell, High-Rise is an all too real one, and, like all Ballard books I’ve read, it’s a compulsive and powerful novel that lingers on the mind like the stench of a rubbish strewn hallway on a summer’s day. This entry was tagged book, book review, Concrete Island, Crash, High-Rise, JG Ballard, literary fiction, London, sci-fi. Bookmark the permalink.